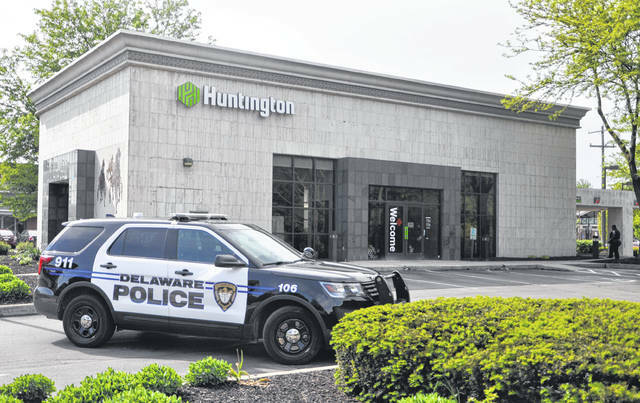 The Huntington Bank at 95 E. William St. in Delaware was robbed shortly after 4:30 p.m. Monday. According to police scanner chatter, law enforcement officers called to the scene were in search of a male suspect. The K-9 unit from the Delaware County Sheriff’s Office was brought in to help with the search. Immediately following the robbery, the bank was surrounded by cruisers from the Delaware Police Department, sheriff’s office and Ohio State Highway Patrol. No further information was available to The Gazette as of press time. The Huntington Bank at 95 E. William St. in Delaware was robbed shortly after 4:30 p.m. Monday. According to police scanner chatter, law enforcement officers called to the scene were in search of a male suspect. The K-9 unit from the Delaware County Sheriff’s Office was brought in to help with the search. Immediately following the robbery, the bank was surrounded by cruisers from the Delaware Police Department, sheriff’s office and Ohio State Highway Patrol. No further information has been made available to The Gazette.